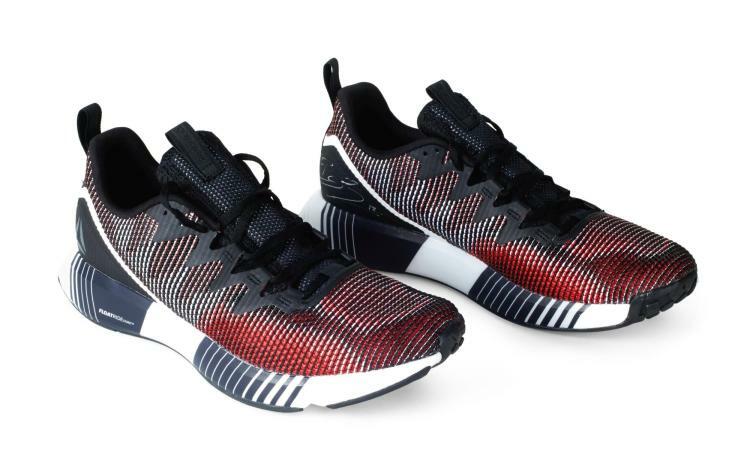 Description: Huntsman has partnered with Reebok on a creative endeavour to bring together the worlds of sport, fitness, fashion, bespoke tailoring and innovation. Designed to look fast and move faster, the innovative new Reebok Fusion Flexweave shoe delivers the perfect mix of function and style. The unique textile upper maximizes flexibility without cracking under the pressure of a tough workout. The Floatride Foam core enhances the cushioning for more comfort when tackling more miles. A visual foot-mapping bottom adds adaptive, multi-dimensional cushioning that takes you farther. To celebrate the partnership, Huntsman created a suit made from the Reebok Flexweave material to the measurements of NFL star and Reebok Running ambassador Brandin Cooks, who also worked closely with Reebok on the development of the Flexweave footwear offerings. The prototype suit demonstrated the versatile potential of Reebok Flexweave, testing the material’s innovative figure-8 weave structure that can interlock different fibres. Led by Huntsman Head Cutter and Reebok Creative Director Campbell Carey, Huntsman took the first generation of Flexweave material designed for footwear and worked the textile into a premium suit. This lot includes a pair of the Flexweave Fusion trainers, signed by Brandin Cooks.